Microdots appear like a small patch of glitter on an Item. Under magnification the dot reveals a unique code similar to a serial number. the microdot pen contains uniquely coded microdots, Immersed in UV-adhesive. Estimated 200+ Applications. Your Nanotag registration holds your unique pin number for the microdots. 4. Place labels on items marked and the exterior of the house. To further deter theives from your home. You recieve varying sized stickers to label items and your property. If any items are stolen or go missing from you. 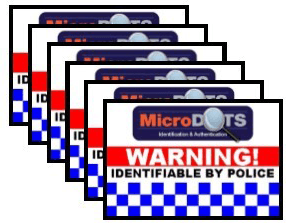 Register the stolen item with police and advise you have the microdot technology. Advise them of your unique Nanotag PIN Number. This then allows police to easily identify your property.